This simple financial map may help take some of the anxiety out of managing your finances. Are you protecting your financial future from its most significant risks? Are you investing your savings in a manner that is in line with your financial goals? Are taxes consuming more of your income than they should? If you’re like most people, these types of questions are probably bouncing around in the back of your mind, and thinking about them makes your head spin. The good news is, this doesn’t have to be the case. 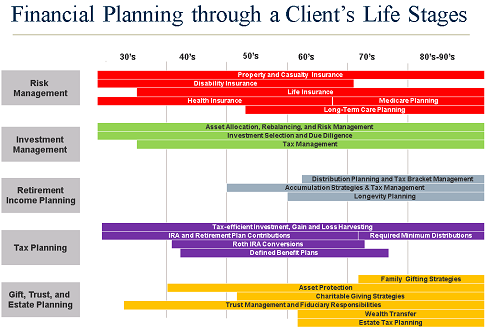 In our three decades of providing financial planning services to individuals and families, we’ve learned to appreciate the importance of identifying and focusing on the financial issues most relevant to each client. We’ve found that considering a client’s age can be a simple yet effective way to pinpoint his or her financial planning needs. For example, while a young professional probably does not need a strategy for gifting assets to heirs, he or she may need to consider a strategy for receiving income in the event that he or she becomes disabled and is unable to work. In your 30s and 40s – Adequate life, disability, liability, and property insurance are crucial to the protection of your financial future. Investing your savings prudently and seeing that you’re not paying more income taxes than necessary can help you accumulate the wealth needed to achieve your goals. Wills, trusts, and other important estate planning documents also can be critical to providing financial security for your children and spouse in the event of your death or incapacity. In your 50s – At this age, you may have accumulated a reasonable amount of assets. As a result, your life insurance needs may have decreased from what they were in your 30s and 40s. However, your disability, liability, and property insurance are likely still critical. You also may wish to start considering long-term care insurance. Your income has likely increased, and an effective savings strategy is also very important, as is developing a prudent strategy for investing those assets. Careful tax planning can help you maximize your accumulation or wealth to fund your retirement and other financial goals. In your 60s – Evaluating your need for long-term care insurance is now usually very important. You also should evaluate when you’d like to begin receiving your social security benefits, as you will now be eligible for them. Retirement income planning, including the identification of a sustainable withdrawal strategy and the minimization of taxes on that income, can help you maximize the mileage you’ll get from your savings. Since you likely have been building your net worth for a number of years, and your family tree has likely evolved, you may wish to consider re-evaluating your estate plan. In your 70s – Tax laws require you to start taking annual minimum distributions from certain retirement accounts such as IRAs. You should evaluate your annual spending and determine if you can continue to fund it from your savings. Developing effective wealth transfer and charitable giving strategies may now be of greater importance for you. In your 80s and 90s – Maintaining your retirement income through effective investment management and income tax planning still remains a top priority. Achieving philanthropic goals and developing an effective gifting strategy may be of increasing priority for many. Maintaining up-to-date durable powers of attorney and health care proxies can ensure that your loved ones have the ability to care for you in the event that such care becomes necessary. It is hard to make the right financial decisions if you don’t know what actions you need to take. That’s why our age-based financial map can be such a useful resource. By identifying which financial matters are most important to you, you’ll be able to work towards your financial goals more effectively and can achieve greater peace of mind. Modera Wealth Management, LLC’s (“Modera”) is an SEC registered investment adviser with places of business in the Commonwealth of Massachusetts, State of New Jersey, State of Florida and State of Georgia. SEC registration does not imply any level of skill or training. Modera may only transact business in those states in which it is notice filed or qualifies for an exemption or exclusion from notice filing requirements. For information pertaining to Modera’s registration status, its fees and services and/or a copy of our Form ADV disclosure statement, please contact Modera or refer to the Investment Adviser Public Disclosure web site (www.adviserinfo.sec.gov). A full description of the firm’s business operations and service offerings is contained in our Disclosure Brochure which appears as Part 2A of Form ADV. Please read the Disclosure Brochure carefully before you invest or send money. This article contains content that is not suitable for everyone and is limited to the dissemination of general information pertaining to Modera’s investment advisory and financial planning services. Nothing contained herein should be interpreted as legal, tax or accounting advice, nor should it be construed as personalized investment or financial planning advice. For legal, tax and accounting-related matters, we recommend that you seek the advice of a qualified lawyer or accountant. Past performance is no guarantee of future results, and there is no guarantee that the views and opinions expressed herein will come to pass. Investing in the stock and other markets involves gains and losses and may not be suitable for all investors. Information presented herein is subject to change without notice and should not be construed as a solicitation to buy or sell any security or to engage in a particular investment, financial planning or other strategy.